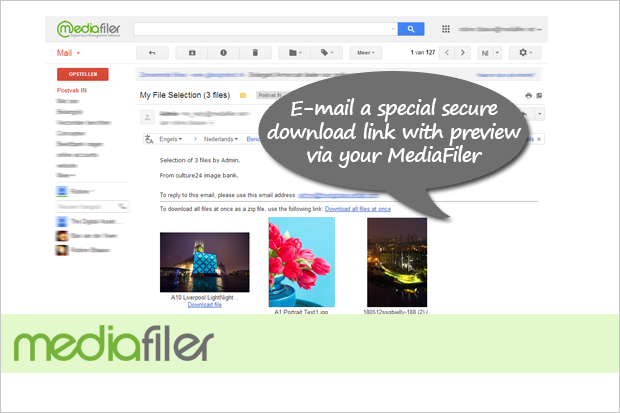 MediaFiler is a cross-platform, web-based, Digital Asset Management (DAM) system with the ability to manage and display numerous file types. MediaFiler is distinguished from other DAM solutions as it is designed as a content management system (CMS) ensuring both rapid deployment and the ability to change functionality and appearance instantly. MediaFiler is specially designed for marketing and communications professionals. Most important tool for a photographer next to Photoshop ! Comments: MediaFiler satisfies all my needs but more important also those of my clients ! Could not work without this tool anymore ! Easy to use and great support ! A great way to manage your digital assets! Comments: We started working with Mediafiler in 2009. So far my impression is that it works very well for our company to organize and share digital assets within the company, or to external parties. It's very user friendly, and the support we received at the rollout was very helpful. Whenever I had some comments and/or suggestions, the guys at Mediafiler always responded fast and issues were solved quickly. Overall, Mediafiler does a great job of helping us keep digital assets current and ensuring that they can be utilized by those who need them, both internally and externally. I would recommend working with them!